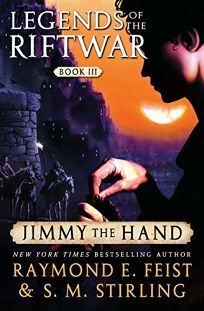 Feist and Stirling bring humor and pathos to 13-year-old Jimmy the Hand's third escapade (after 2002's Murder in La Mut). Krondor's ever-resourceful boy thief, not content with helping Princess Anita and Prince Arutha make a seaward escape from the city's viceroy, rescues Hotfingers Flora and some unlucky fellow thieves from prison. Jimmy goes into exile with grateful Flora, hoping to find her Land's End relatives, and soon winds up aiding another damsel in distress: fellow teenager Lorrie Merford, searching for her younger brother, who was kidnapped by her parents' killers. This simple, charming fairy tale will appeal to adult fans of the Riftwar books as well as mature teens who don't mind a bit of romance in their sword-and-sorcery.